This League will begin April 7th at 7:00 pm and be played the 1st Thursday of each month until September 1st. This family friendly night of networking can also prove to be a great team building for your office as well. The cost is just a one time fee of $300 for the company to be entered. This cost covers teams of 4 to play 3 games and their shoe rental for 6 months. Teams can be different each time too so this will give everybody in the office a chance to represent their company and compete for a trophy. The team with the highest score each month will receive a trophy to be displayed in their office until they return. 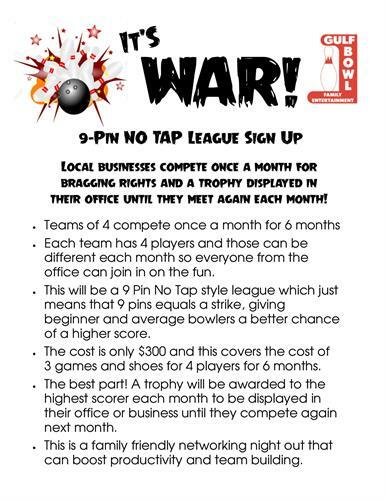 This will be a 9 Pin No Tap style league which just means that 9 pins equals a strike, giving beginner and average bowlers a chance of a higher score. This league will be open to business professionals in a like minded field so that they all benefit from the networking aspect. So Real Estate offices, Builders, Bankers, Title & Lending companies, and affiliates are all welcome to take part. We already have companies signing up so don't miss out! Also, we will open this league up to any and all business in the winter months so if you think your company might want to participate but isn't in the fields listed above please email us for more info at gulfbowlparties@gulftel.com.